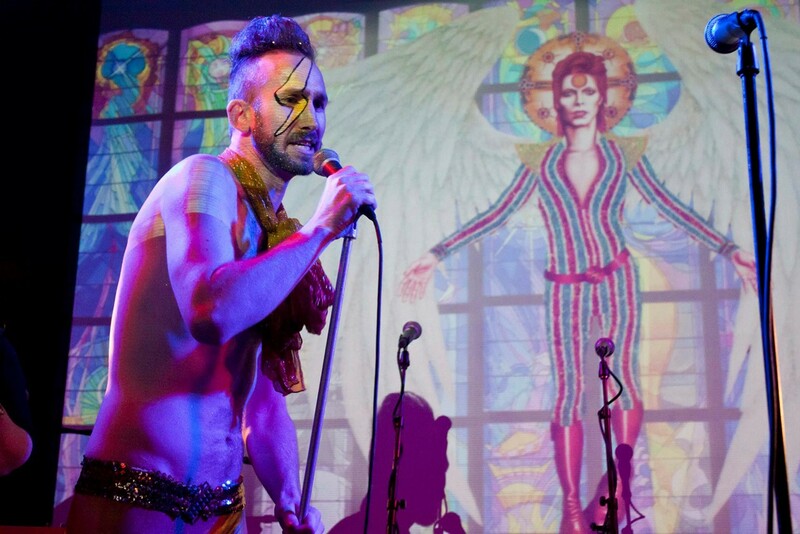 The First Church of the Jerk, a worshipful David Bowie cover band, and Sunday Assembly atheist church are redefining divinity, and singing their hearts out in the meantime. Reverened Father Lysol Tony-Romeo of the First Church of the Sacred Silversexual. A church sprouted in Atlanta last spring, but it isn't your typical place of prayer — it's called the National Church of Bey, and its followers worship Beyoncé. 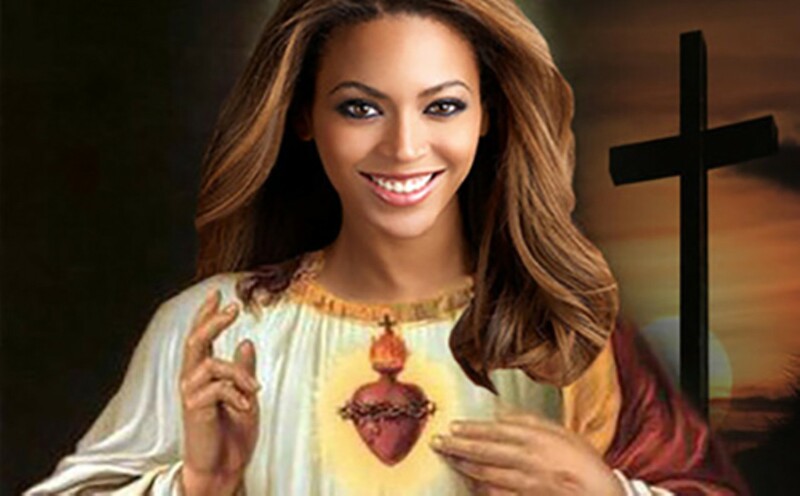 Its devotees, known as Beys, gather to sing the pop star's songs, and even have their own holy book (called The Beyble, naturally). On the group's cheeky Tumblr, founder and "Minister Diva" Pauline John Andrews asks critics and naysayers (beysayers?) not to dismiss the church's unusual beliefs. "We are very disappointed in the failure of the public to recognize the existence of a divine Deity walking among them. Deity's [sic] often walk the Earth in their flesh form. Beyoncé will transcend back to the spirit once her work here on Mother Earth has been completed." Though that church appears to be mostly a joke (requests for comment were sadly not returned), the Bay Area is no stranger to unorthodox churches with musical slants (and let's not forget the Church of John Coltrane in San Francisco, which recognizes the late jazz saxophonist as its saint). The First Church of the Jerk, which happens each Sunday at rotating homes throughout Oakland, is one such example of a musical, church-like gathering. "As it's evolved, we've attempted to define just what nerve we've struck here," said Miss Roach, the Pope of Jerk Church. 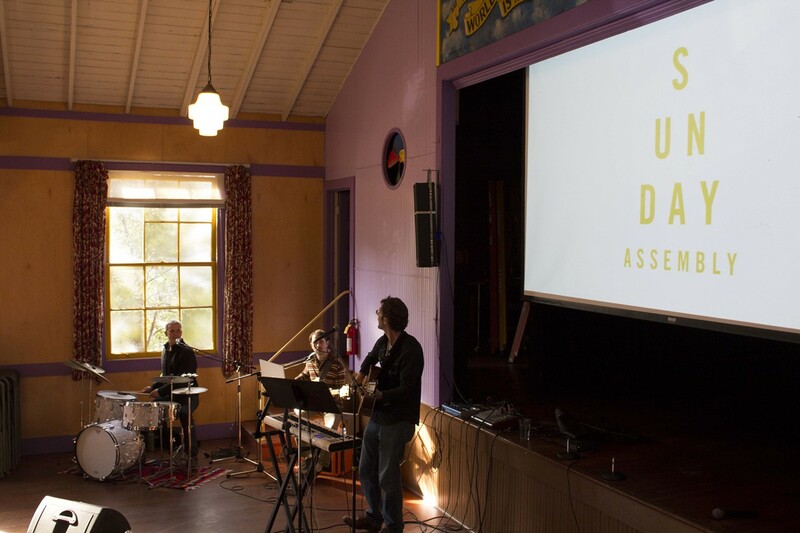 "The best I can say is that we have created a space for people to participate in intentional community, a place where they can learn an instrument with no judgment, and a place for people to feel free to be a bit of a weirdo." Despite not knowing precisely what nerve it has struck, Jerk Church has clearly taken off in a big way. Miss Roach said the church now has chapters in Seattle, Portland, LA, Reno, Sacramento, Vancouver, Victoria, and Connecticut. It started, as most things worth doing do — with a newly purchased accordion and a group of friends in West Oakland. "I was hosting a Sunday early afternoon hangover cure barbecue and Irish caroling practice," said Roach. "I had just planned an event for St. Patrick's Day — 'Irish Caroling' — in which we would take our instruments to the streets of San Francisco and sing to people. It was a way to reclaim the day for us — to have fun, be silly, sing songs, and hopefully avoid getting green beer spilled all over us." The event was a success, and Roach and her fellow Jerk founders decided to do it every week. Though its name is unusual, Jerk Church doesn't use the word pejoratively. "As this community has evolved, we've come to understand that 'jerk' is simply someone who doesn't necessarily fit the mold of the dominant paradigm," said Roach. "Many of us were raised religiously as children, so subverting the concept of 'church' into simply a community gathering that focuses on communal meals and song (and a bit of whiskey) was delightful for us." Reverend Father Lysol Tony-Romeo, founder of the First Church of the Sacred Silversexual, also subverts the concept of churches and religious iconography with his worshipful David Bowie cover band/performance art/drag revue. "We believe that religious concepts like 'divine,' 'holy,' and 'sacred' are essential elements of humanity, and they've been held hostage for too long by stuffy clerics who have drained all humanity out of worship," said Tony-Romeo. "We aim to reclaim these and redefine them to fit our spirituality. Maybe what's really divine is a pair of mirror-balled silver boots!" When asked how Tony-Romeo explains the Sacred Silversexuals to people who have never heard of it, he said he describes it as "like a Christian church, but we worship David Bowie instead of Jesus, so we sing his songs and spread the message that David Bowie loves you! We perform parables from his canon in lieu of a sermon using elements of drag as well as other performance arts. "If that gets blank faces," Tony-Romeo added, "I call it a rock opera." 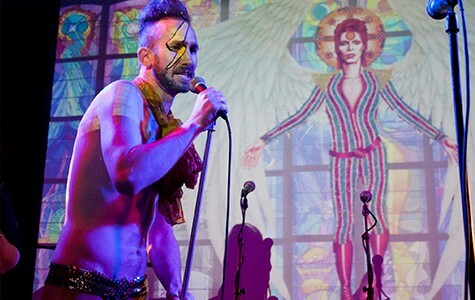 The Silversexuals recently performed at Oakland Metro Opera House in the Jack London district with Hubba Hubba Revue and Tourettes Without Regrets and the group is planning its fourth annual Bowie birthday bash, to be held January 9 at (appropriately) The Chapel in San Francisco. "Each generation gets to redefine divinity as they dare," Tony-Romeo said, adding, "Bowie isn't the only revered one in our religion. We believe he is one among many incarnations, but instead of Bodhisattvas we refer to them as Bowiesattvas." Having a sense of humor, as Tony-Romeo's and Roach's wordplay illustrate, is necessary for such musical churches to thrive. Another such example comes from Sunday Assembly, an atheist "church" whose tongue-in-cheek slogan is "Good is great." In addition to its "sermons," which are basically TED-style talks on topics such as gratitude, robots, neuroscience, and what it's like to take a seventeen-year vow of silence, each Assembly starts with singing and dancing to songs such as "Thriller," "Monster Mash," "Superstition," and "Proud Mary." "I think there is something very social about music in general," said Jasmine Marrow, one of Sunday Assembly's organizers. "You can see it in traditional churches, and at the bar and everywhere in between. It can so quickly convey emotion and meaning even across language. We start our SA meeting with a song before we do really anything else because it brings us all into a shared moment. And we always start with a fun one, because it brings joy to the room immediately." The concept of music as a unifying force isn't that surprising when you consider that group singing has been scientifically proven to lower stress, relieve anxiety, and produce endorphins. "Experiencing music and singing together acts as a social bonding tool and is an important part of the human experience," said Marrow. Jerk Church's Miss Roach put it simply: "There's something very powerful about people raising their voices together in song."